Also included is a comprehensive test containing the top 100 most commonly tested questions in Internal Medicine with the correct answers. To get the most out of this course, we recommend that you listen to the entire audio once while taking notes, then go back and listen to areas you had difficulties with. 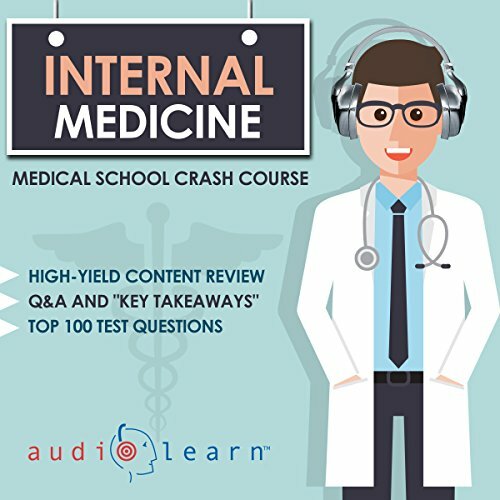 Internal Medicine is an extremely detailed audiobook divided into twelve chapters. From critical care medicine to oncology care, this audiobook is geared towards individuals who are interested in acute and chronic conditions which internists often see. The audiobook discusses management of these diseases, and offers a quiz following the summary to test the listener. The audiobook first examines the role of the internist managing clients with critical illnesses before diving into diseases by the systems. In this chapter, multi organ dysfunction syndrome (MODS), trauma, and triage are discussed. It speaks in utmost detail the management of an individual facing MODS, through signs and symptoms that may be present, as well as diagnostic testing to run. In the second chapter, cardiac care is discussed. In this audio clip interventional cardiology is discussed, and the caring for an individual who is suffering from certain heart conditions. The chapter discusses the management and treatment of an individual suffering from a myocardial infarction, as well as a individual in heart failure. The third chapter discusses the management and treatment of individuals with endocrine disorders. Although there are many, the chapter discusses the pathophysiology and management of diabetes mellitus, adrenal gland disorders, thyroid disorders, and reproductive gland disorders. The fourth chapter discusses gastroenterology. Again, there are many gastroenterology diseases, which would be seen by an internist, however the chapter discusses the most commonly seen ones: gastro-esophageal reflux, gastric disease, irritable bowel syndrome, and inflammatory bowel disease. As gastrointestinal disorders are common, the audiobook also has one area dedicated to a general approach for the internist to gastrointestinal problems. The fifth chapter discusses geriatric medicine. This chapter speaks of management of the elderly in a retirement home, as well as palliative care. This chapter speaks of the process of caring for the elderly in a retirement home from an internist’s perspective. This chapter helps the listener understand how a nursing home operates when a resident develops an acute illness. This chapter discusses advance directives in addition to palliative care. Under palliative care, comfort, pain control is among the things that will need to be managed when an individual is undergoing the process of death and dying. The sixth chapter discusses caring for clients with blood disorders. Hematological disorders discussed in this chapter include: bleeding disorders, bone marrow disorders, and the management of patients with anemia. The seventh chapter touches on oncology and how cancer is treated. In this section, the listener will learn about chemotherapy treatments, radiation treatments, immunotherapy, and nutrition for cancer patients. The eighth chapter discuses infectious diseases, primarily the management of a septic patient and caring for a patient with pneumonia. The ninth chapter is about the management of patients with kidney disease. This chapter provides a general overview on both acute and chronic kidney disease, the management of an individual with kidney failure, and the management of an individual on dialysis. The tenth chapter is entitled pulmonology. Usually internists care for individuals with chronic lung diseases such as: chronic obstructive pulmonary disease, emphysema, and chronic bronchitis. The eleventh chapter discusses rheumatology. Two of the most common rheumatologic disorders which internists see are: rheumatoid arthritis and osteoarthritis, and autoimmune diseases. The twelfth and final chapter discusses hepatology. Hepatitis is discussed in detail, as well as the management of patient with liver failure. In each chapter, the audiobook offers a brief summary and a quiz. Following the chapters, the audiobook provides a summary on the audiobook itself. The listener can then proceed to a hundred-question course test. One of the greatest benefits of this audiobook is the ability to learn and review common acute and chronic disorders seen by internists. It is a useful resource for the listener to review this conditions and how to care for individuals with these disorders. As it provides a broad overview on these conditions affecting each system, many other conditions are not covered. In terms of the quiz, the listener should keep in the mind that in the final course test, the answers are given after the conclusion of the test. The answer to the question is followed by a rationale. 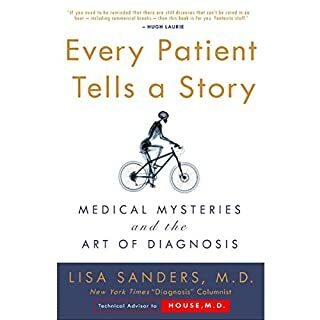 My favorite part of the audiobook is chapter five, geriatric medicine. I liked how the listener is provided insight on caring and the management of a nursing home patient. Although the chapter speaks of a resident in a nursing home, I also feel that the challenges and aspects discussed can be applied to a client who is elderly. The other aspect that I enjoyed reading in the chapter is management of death and dying. It provides the listener an understanding of providing care and promoting comfort to the individual at this stage in their lives. Not only is the physician caring for the individual, but also their family members and loved ones. Overall after listening to this audiobook, I would highly recommend it to individuals who are interested in internal medicine. 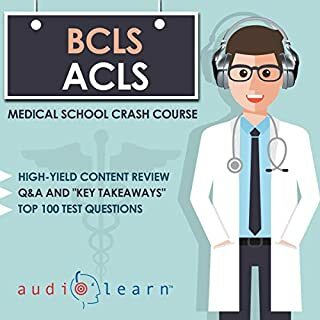 Whether the listener is a beginner or looking for a review, this audiobook offers a broad overview of acute and chronic conditions commonly seen in internal medicine. Listeners can quiz themselves on the questions that the audiobook provides. The questions asked are patient scenarios that internists may come across in their practice. Although the disorders discussed were broad, the audiobook provided a detailed description of each disorder. Not for health professionals . The information is too general that you dont really learn anything new. Reads more like an article in a magazine. Narration is also average, like somebody reading it out loud without any real emphasis on important points. It feels like the emphasis is on the reading, not on the teaching. Disregard the 5min audio sample! I was very reluctant to get this book because a different review said "not for medical professionals." I'm a FM PA-C, and there is no way in Hell a laymen is going to understand casual mention of "end organ damage," "TPN," 3rd Gen Ceph," "crystaloids," ect. I don't think that person listened to the book, just the sample clip. I listen to most things at 1.4 speed and I had to slow it down. The narration isn't great. She reads simple sentence with the same speed and inflection as specific lab, Tx protocols, or dosing formulas. I'm only half way through the first chapter. I'll update this if my option changes. I assumed this would be pretty bad but I had a credit to use up before canceling my account so I figured what the heck, maybe it will be entertaining...it was not. The information is way too basic for even the Medical School student who is in basic sciences and wants something to prepare him/her for the wards 3rd and 4th year. It is laughably incomplete and lacking in any useful detail about medical decision making or actual management of any disease or condition. 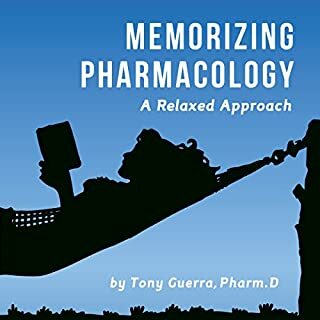 It is poorly suited for even the layperson who is interested in learning about medicine, thanks to the authors decision to include such little substance that the only suitable demographic for this book is the medically uninformed while also utilizing medical language that someone from this demographic will not understand without stopping frequently to look up. Overall I believe that the authors intent was to create a book that would appeal to multiple educational demographics (sell more copies) but in doing so actually created a book that is useful to no one. Not a good pick if you have any basic knowledge. This is a good choice if you know nothing about anything. The info is very basic. While medical terminology might sometimes sound like gibberish, this is ACTUAL gibberish. An example: "Sepsis can cause i high degree of inflammation". No, sepsis IS a state where there a high degree of disseminated inflammation (infection, even) in the body. It does not CAUSE inflammation. This book rattles off medical sentences, many nonsensical, seemingly without any understanding and certainly no attempt to present the information in a way that will help the reader grasp and retain it. As a 4th year med student I thought this audiobook might work as some light repetition during the summer break but it it just awful. Even though already familiar the topics and treatments I have a really hard time making sense of what the narrator says. Whether you are a medical professional or a curious layperson you should steer well clear of this one.